The punch holes that make notebook paper and other loose pages so easy to move around also leave them vulnerable to tearing. This results in lost pages at worst and an unsightly, untidy-looking notebook or binder at best. 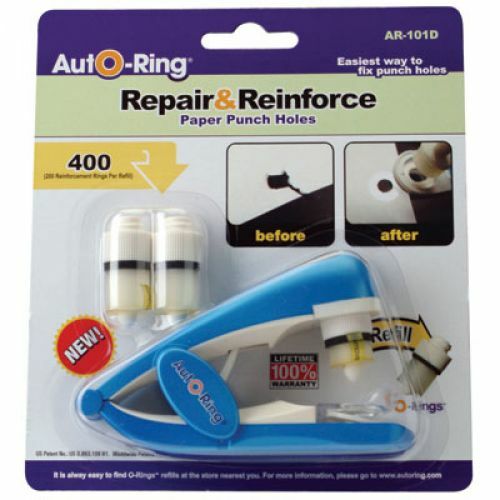 The AutO-Ring makes it easy to reinforce loose-leaf punch holes so they stay neatly where they belong. Just aim, press and release / an O-Ring is automatically applied around the punch hole in one easy step. The O-Rings are made of a thin, strong Mylar that resists tearing. Also use to repair pages that have already been torn. Comes with 2 cartridges./ Applies reinforcement O rings to paper punch holes/ Plastic /stapler/ shaped design/ /O/ rings made of Mylar tape/ Unit comes assembled/ 2 Reinforcement ring cartridges included/ 200 rings per cartridge/ Measures approximately 4-1/2" x 2-3/4" x 1Colors:/ Blue/ Purple/ Charcoal* Let us choose your color!